Good Morning and Welcome to Sunday the 24th day of May, 2015. It is a beautiful morning here in Edmonton, sun shining and a cool breeze masking the heat. Yesterday felt like a July day ….. HOT. Weather is a funny thing not funny ha ha but strange. This morning is what I deem as perfection. It is warm but the breeze keeps it comfortable to be out and about. But alas, Mr. Alvin is on his sleepover at his sister’s house. His first one at their new place. I am excited to hear all about it. While he was away and the reason for his sleepover the furnace was cleaned. Two of the nicest young men did the job. Funny though they both told me different sizes for the furnace filter ( I already know which one ). Perhaps it was the hot day that messed with their memory. Once they left I got busy …. it was close to 4 p.m. but better late than ever. It took some work and at one point I was thinking it would have been nice to have had some help. But I kept at it and got them out. Got most of the dirt from the roots and then as the shrubs lay on the lawn …..
One was quite heavy and with branches how am I going to dispose of them. Aha, I thought ….. get those big stretchy black garbage bags ….. I managed to squeeze each one into their own bag. Then lugged them to the back …. up the steps and onto the deck and up more steps and into the garage. It took me almost one hour to get the shrubs out but I must tell you, I felt like a million dollars. I did it all by myself …… I am strong and not reliant on someone else. Then after that I raked and moved the dirt around in the now naked flower bed. Then I had to find something to put the dirt into …. I found a ten gallon pail in my garage. Now let me you a pail full of dirt is not light. 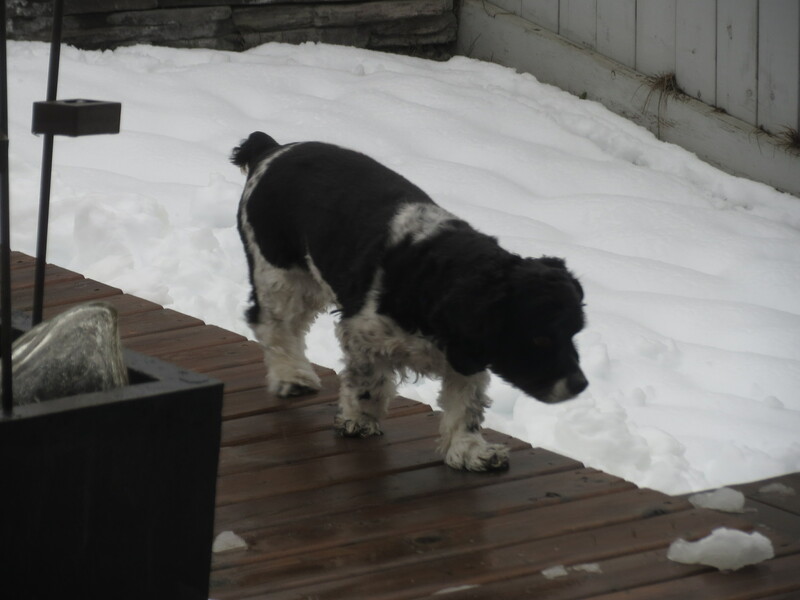 But I hauled five of them from his yard across the back alley into my garage down both sets of steps on my deck across the path between me and my neighbour’s to the front flower bed. I do believe that going to bootcamp helped me to complete this task. I definitely could feel my core and arms doing what they were supposed to …. Here are some photos: furnace cleaners and the flower bed ….. forgot to take before photos !! Was so grateful to have my kids shovels and garden tools to use…. Now all I need is a couple of bags of potting soil to top it up and then some flowers. YAY ….. I did it. Good Morning and Welcome to Saturday the 9th day of May, 2015. This morning is bright and sunny and breezy. Three mornings ago that was not the case. Just got my photos downloaded, so thought I would share. Makes me so grateful that the snow came at this time of year when the sun is higher in the sky, and feels so much warmer …. melts that snow so fast. We needed the moisture so we, I am most happy. In photos over the course of the day on Wednesday, May 6th – starting at 5:00 a.m. until I arrived at home just after 5:00 p.m. I could not believe how much wet heavy snow had accumulated over the course of the day. Wished that I would have taken a photo of the trees…… green new leaves peeking out from a cover of snow. The snow was so heavy it felt like lifting a load of bricks. It was so much fun shovelling. 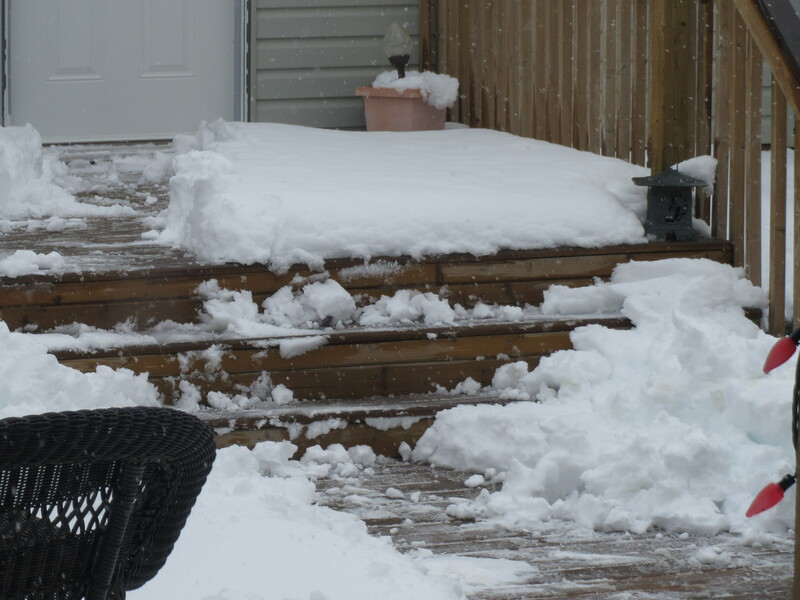 AS you can tell I could only manage a small amount of shovelling on the deck. Poor Mr. Alvin did not know what to do. Thank goodness he is great at jumping. The photos above with the ice cream truck were the next day. Not much snow left. I thought it was so funny that we had snow on the ground when I heard that magical music that could only be the ice cream truck. I was shocked. They only have a short season to earn some money so I totally understood. Now better get to things ……. Special Hello to: all my friends and family …..